1. 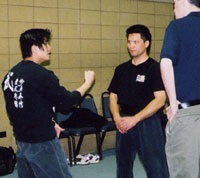 Sifu Phil pointing to the specifics of the Ving Tsun stance during a pre-competition seminar. 6. 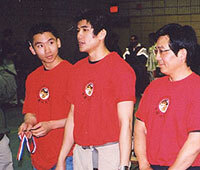 Instructor Daniel Hung awards a Silver in sparring to Yu Ming. 2. 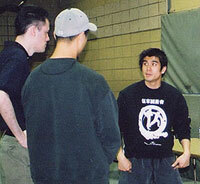 Sifu Phil offering a contrast to the Ving Tsun stance during a pre-competition seminar. 7. Students of the Ng Family Academy ready to receive their awards. 3. 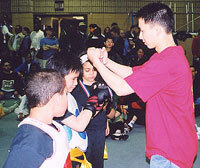 Sifu Phil describing the structure of the Ving Tsun punch during a pre-competition seminar. 8. 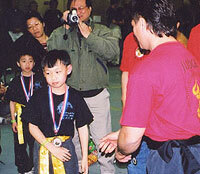 Steven receiving his bronze in the sparring competition. 4. Instructor Daniel Hung admiring Sifu Phil's child-like complexion. 9. 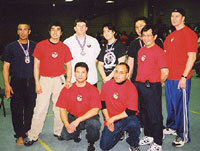 A group photo with members of the Ng Family Chinese Martial Arts Association. 5. 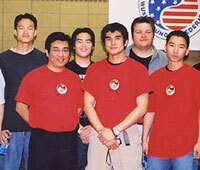 Group photo of the judges and competitors of the Ving Tsun Chi-sao division. 10. Our children competitors display their hard earned medals. © 2000 Philip Ng and Sam Ng. All rights reserved.